The GoldenBraid 2.0 Kit provides plant scientists with a resource for the modular cloning of multigenic DNA constructs in Plant Synthetic Biology applications. The kit consists of 95 plasmids which include the complete set of vectors required to perform GoldenBraid cloning. Detailed information, tutorials and software tools for GB cloning can be found at https://gbcloning.upv.es. 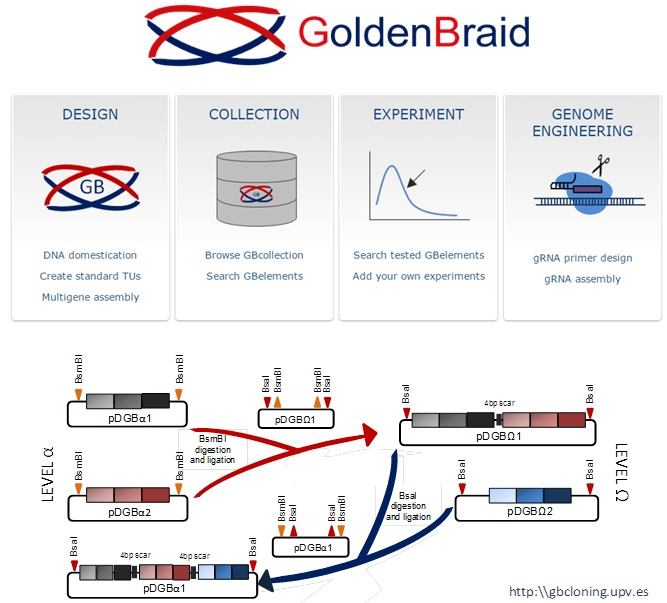 All Golden Braid 2.0 DNA parts are fully compatible with Golden Braid 3.0. GoldenBraid 2.0: a comprehensive DNA assembly framework for plant synthetic biology. Sarrion-Perdigones A, Vazquez-Vilar M, Palací J, Castelijns B, Forment J, Ziarsolo P, Blanca J, Granell A, Orzaez D. Plant Physiol. 2013 Jul;162(3):1618-31. PubMed PMID 23669743 . It also includes 51 standard basic parts (including promoters, terminators, operators, transcriptional activators/repressors and protein coding regions) and 17 transcriptional units with different functions as resistance markers, reporter genes, CRISPR/Cas9 genome editing tools, etc. Software-Assisted Stacking of Gene Modules Using GoldenBraid 2.0 DNA-Assembly Framework. Vazquez-Vilar M, Sarrion-Perdigones A, Ziarsolo P, Blanca J, Granell A, Orzaez D. Methods Mol Biol 2015; 1284:399-420. PubMed . Design and construction of multigenic constructs for plant biotechnology using the GoldenBraid cloning strategy. Sarrion-Perdigones A, Palaci J, Granell A, Orzaez D. Methods Mol Biol 2014; 1116:133-51. PubMed . A modular toolbox for gRNA-Cas9 genome engineering in plants based on the GoldenBraid standard. Vazquez-Vilar M, Bernabé-Orts JM, Fernandez-Del-Carmen A, Ziarsolo P, Blanca J, Granell A, Orzaez D. Plant Methods 2016 Feb 1;12:10. PubMed .